I’m excited about today’s Swatch Sunday. It’s another VIP polish from The Indie Shop Atlanta! Genofeva of Brabant is Colors by Llarowe‘s contribution to the VIP bag. It’s my first CbL, and I’m not sure I’ve ever worn a polish quite like this. I’m wearing three coats with one coat of Seche Vite. 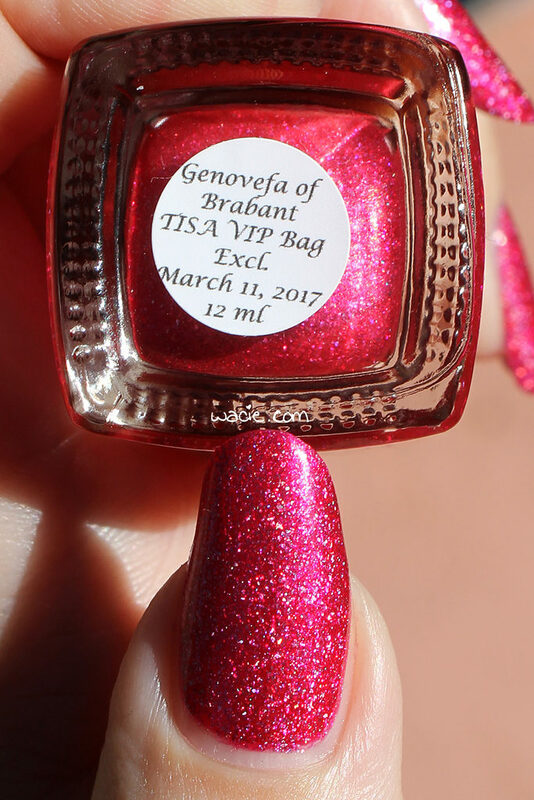 Genofeva of Brabant is a cool-toned rose polish with a strong rosy glow and holo glitter. Actually, this polish has a holo finish that I can’t quite describe. It clearly has glitter in it, but there’s a slight allover holo in it too, like a scattered holo. I’m not sure, but I love it. Application was great; even though there’s a lot happening in this polish, the product consistency is velvety smooth. I had a great first coat, and full opacity at the second. It dries to smooth satin finish. I don’t usually talk about how easy it is to remove a polish, but I was surprised at how easily this one came off. I expected to struggle with the glitter, but it just comes right off. I failed to capture the holo effect in this polish. It just looks like silver. This is one of my top five polishes from Indie Shop Atlanta. I was so excited to swatch this because it was probably the first polish that caught my eye, even before the event, and I don’t really have anything like it in my collection. I’m also excited to finally be trying Colors by Llarowe! I got a few others from the event but this is the best one. Genofeva of Brabant was a VIP exclusive. Other Colors by Llarowe are available on their website. I got this polish in a VIP bag at an event. This entry was posted in Swatch Sunday and tagged Colors by Llarowe, glitter, indie, pink, swatch. Jeez – CbL hits every polish out of the park! I love her colors and finishes! This is absolutely stunning in the sun! thats so pretty. I love a good, solid pink sparkler. I love red polishes and this one has so much extra. It’s beautiful on your nails. Love this sort of in between pink and red color! I like the shape and length of your nails! Colors by Llarowe really knocks it out of the park with stunning polishes! Wowza! So vibrant! This color looks so lovely on you! This is such a stunning, bright shade! This is a year-round shade! Love the sparkly goodness. Look how sparkly it is! That color is so pretty! I just love how vibrant it is. That looks fun to wear. The holo makes it so striking. Such a shiny color! I bet you got a ton of compliments on your nails. This shade is truly stunning!!! Gorgeous swatch!